For the first half of last year, I was working in California. One of my best friends, who was still in Boston, is a big travel geek like me, so we began talking about the travel opportunities our newly cross-country friendship gave us. One thought we had was road tripping from San Francisco back to our respective homes in Ohio and Pennsylvania. She was going to fly out and we would make our journey back east, stopping across America, gaining an even greater appreciation for the country. Naturally, there were some drawbacks. For starters, my friend didn’t have a license, which meant I would be doing all the driving. Next was the fact that I don’t love driving, and quite frankly am not what you would call a ‘great’ driver. Then you have the fact that I didn’t have a car out in California. Nevertheless, these all seemed like surpassable obstacles. We were going to have an adventure and no one was going to stop it. Then my friend’s sister was accepted a study abroad opportunity in Vienna for the summer and wanted my friend to meet up with her once her term ended. The problem? That would give us, at most, seven days to drive cross country. And while I’m all for a road trip and the adventures that come with, in my fantasy trip we have days to stop and explore national parks, not just do quick drive-bys. My friend still wanted us to have a summer adventure though and suggested an alternative: she and I would go to Europe a few days before we were to meet up with her sister (we ended up going to Belgium), head to Vienna, and then with her sister travel somewhere else for a little bit before I would fly home and they would continue on with a sibling bonding trip. One Black Friday plane ticket later, my friend and I were ready to go – and for Vienna, we would even have our own tour guide! Because of my friend’s sister we were able to see a ton of Vienna in a short period of time, as we didn’t have to factor in time spent getting lost on the metro and spinning in a circle trying to orient ourselves on Google Maps. Even better? She showed us her favorite attractions, making my list of favorites much longer, especially considering the short amount of time we were in Vienna. The first Vienna attraction I saw was also one of my favorites: the Schönbrunn Palace and Gardens. The summer residence (because while some people have beach houses, others have summer palaces) of the Austrian royalty has 1,441 rooms and a garden so large it contains not only flowers, but a vineyard and a maze as well. What I loved about the Schönbrunn Palace and Gardens was that it had a little bit of everything I enjoyed. People are able to tour the palace, and while taking the tour I was able to learn more about not only the history of the Habsburgs and assorted royalty, but also about the history of Vienna. The palace itself is also stunning, inside and out. Inside each room is extravagantly designed, featuring rows upon rows of chandeliers and mirrors, as well as spectacular oil paintings, some of which were being lent out to other museums during my visit. The outside is equally stunning, with the buttery yellow exterior making everything seem brighter. The gardens also provide an additional layer of fun: a short hike. The garden itself is 1.2 km tall and 1.0 km wide, with the end rising into a hill with the Gloriette at the end. The Gloriette, a little building that is an observation deck and cafe, sets the scene for an incredible picture – a sweeping look at the palace and gardens. A recurring highlight across many of my travels are the markets I visit. Whether in Montreal, Seattle, or New Orleans, they typically end up being one of the best parts of my trip, even though every time I go I don’t expect to love it as much as I do. Vienna proved to be no different with its celebrated Naschmarkt. 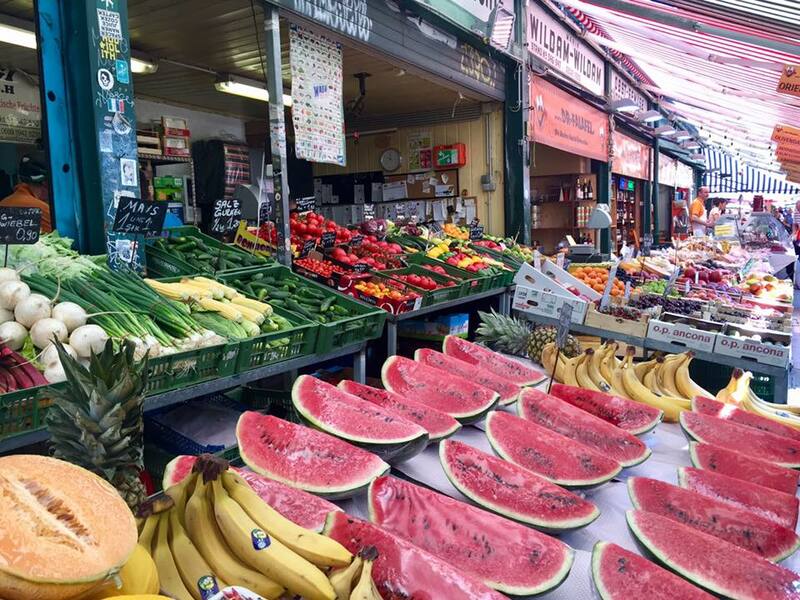 Almost a mile long, it seems as though you can buy anything here: fresh fruit, cooking spices, meat, even a full meal at one of the little restaurants inside. And when I visited there was a flea market extending the market, selling a range of good from tchotchkes to beautiful paintings. The Naschmarkt felt more alive to me than the rest of Vienna. While my friends and I only spent a short period of time here, the energy at the market was contagious and made me feel full of energy, something few places in Vienna did. And while it was clearly a place heavily visited by tourists (with some guided tours being run through the stalls) it was lively, energetic, and exciting, making it a favorite Vienna stop. 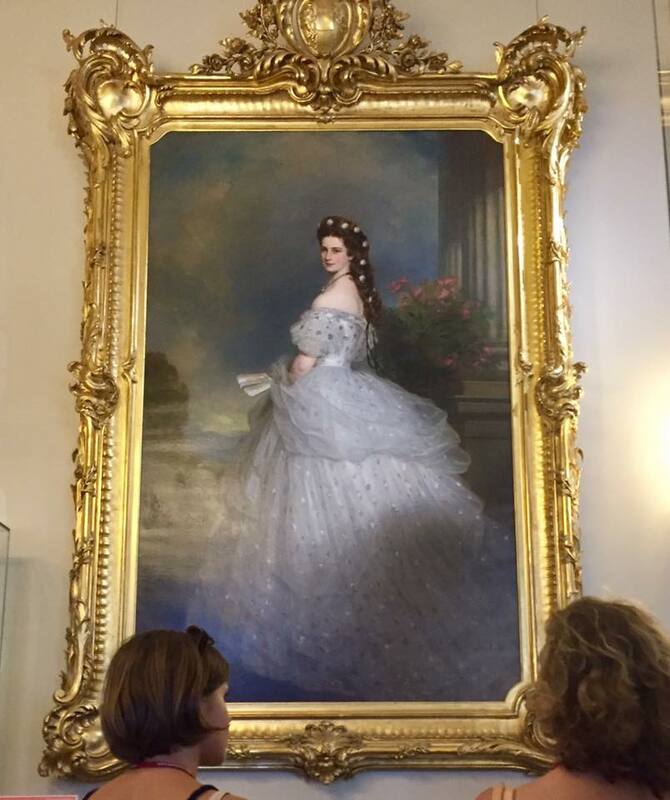 Not to nerd out too hard, but part of the reason I was excited to visit Vienna was because Austria is where Empress Elisabeth ruled (between the years 1854 and 1898). Empress Elisabeth (know as “Sisi”) was a badass lady, getting into disagreements with her terrifyingly powerful mother-in-law, Archduchess Sophie, influencing policy, especially around the nation of Hungary, and in general bucking tradition whenever it didn’t suit her. After reading a fantastic book about her, I wanted to know even more. So while in Vienna I made the Sisi Museum a priority. Had I not been a fan prior to the visit, I probably wouldn’t have cared enough to go to a museum dedicated solely on one person, but being interested meant I didn’t accidentally skip an incredible attraction in Austria. The Sisi Museum was great. It covered everything from her early life to the assassination which killed her and featured over 300 objects on display. The museum touched on how she was misunderstood, why she might have been feeling that way, and what made her so influential. The museum also had other beautiful additions, such as her coronation dress and stunning paintings, not to mention access to the imperial silverware and china, objects I enjoyed much more than I was expecting to. In case my excitement for a museum based on a historical fiction novel I read doesn’t give it away, I am a big book lover. I love most of anything relating to books – sitting down with a good book, browsing bookshops, reading reviews, and libraries. So naturally when in Austria it was essential to see the country’s largest library which holds over 7.4 million books. 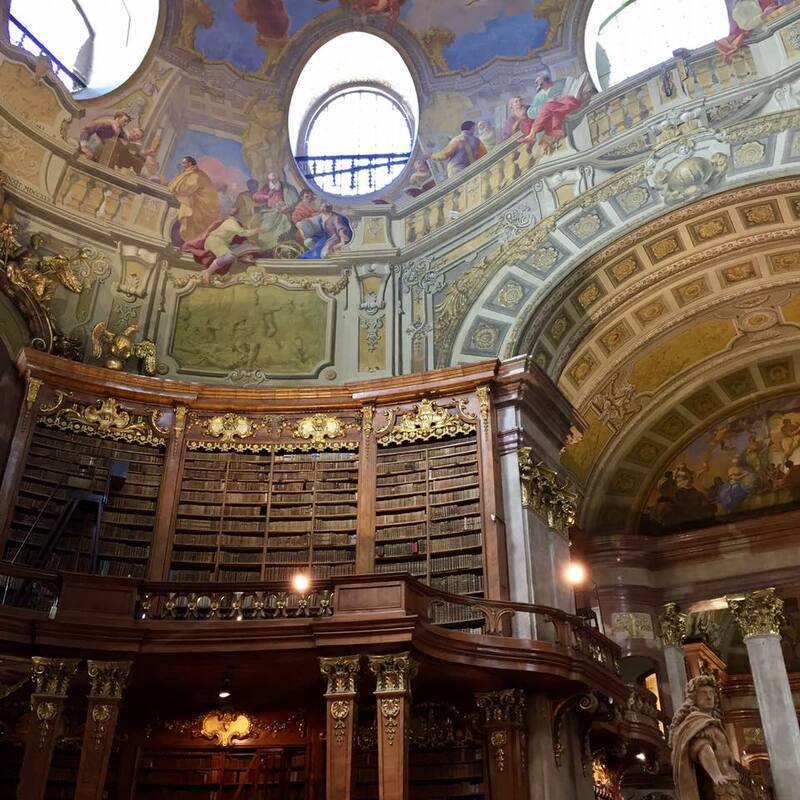 Although my visit to the Austrian National Library was quick, as my friends and I were running out of time in the city, it was most definitely worth the short stroll. For starters, the museum is located in Museumsquartier, the section of the city dedicated to museums. Part of what makes museums so great is that they look so intimidating from the outside. They are usually large, ornate, and promise greatness within. What’s perfect about Vienna is that the library is like this as well, and by being surrounded by so many similar looking buildings, it gives the library an even more impressive look. The interior of the library is also absolutely stunning, in a way that is so ornate it is almost overwhelming. While I was only able to explore the State Hall, the famed part of the library which helps make it one of the most beautiful in the world, there are also other museums within the library: the Literature Museum, the Globe Museum, the Papyrus Museum, and the Esperanto Museum. I was unaware that these additions even existed while I was visiting, but should I ever find myself in Vienna again I will definitely check them out, especially if they have even a fraction as much splendor as the State Hall. Because my friend’s sister had been in Vienna so much longer than my friend and I, she was knowledgeable about the best places to go for food. So for our last night in the city she directed us to a restaurant on the outskirts of the city, one set beautifully against a vineyard. Her class had taken a trip there earlier for one of their first meals in Austria, and she had loved it so much she wanted to end on the same high note. While I had just come from Brussels where I learned to appreciate food to a much greater degree than I usually do (as usually it’s what I make concessions on while traveling to save money) I wasn’t expecting much. While now I know better, at the time Vienna didn’t have as strong associations with particular dishes the same way Belgian waffles or Belgian chocolates did for me. Our last dinner in Vienna was spectacular though. Everything was fantastic. We were seated outside at picnic tables on a cool summer night, our waiter volunteered to put in orders for whatever he thought we would like best, making sure we were going to get a great meal, and we had no plans or places to go afterward. 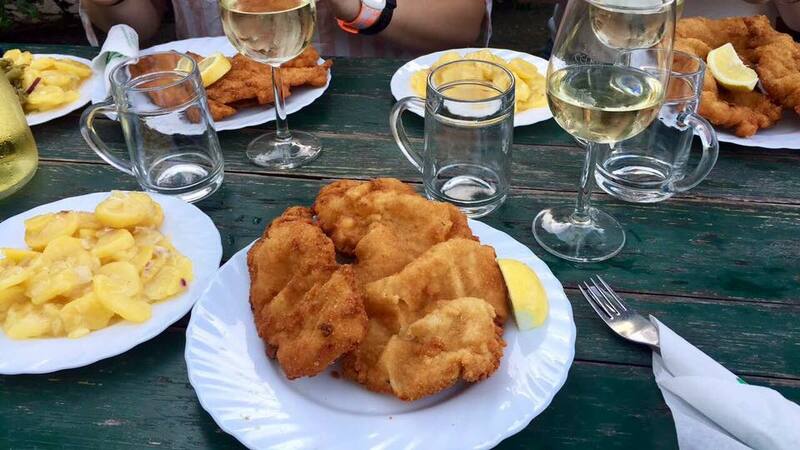 We had schnitzel, potatoes, and wine the ‘proper Austrian’ way, which required white wine, sparkling water, and grape juice poured together in differing amounts to create a delicious and refreshing drink. The best part though was taking some time to do nothing but enjoy one another’s company. While the entire trip to Vienna was interesting because I was able to see a new city, it did feel a bit packed, like we were constantly running from one place to the next. Part of this might be because I didn’t fall in love with the city the same way I had with other throughout my travels, but regardless, carving out time to sit and enjoy being in a new city with incredible people was definitely one of the highlights of my trip, and one I recommend anyone traveling take, no matter where in the world they are visiting. This entry was posted in Europe, History, Travel and tagged austria, europe, museums, top-attractions, travel, vienna. Bookmark the permalink.